John passed away peacefully at Eastgate Lodge on Saturday morning, February 9, 2019, at the age of 91. 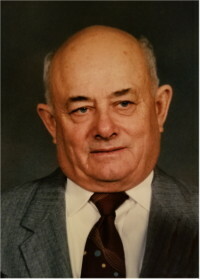 He was predeceased by his sister Nina Regula, brother Robert Gmitroski, brothers-in-law Tom Regula and Bill Bodnar, and sister-in-law Millie Gmitroski. He leaves to mourn his passing, his wife Rose, his daughter Sharon, his beloved granddaughter Jackie (Dylan), sister Betty Bodnar, brother Tony (Audrey), brother-in-law Richard Rattai, sisters-in-law: Clara Matchizen, Joan Modjeski, Pat Rattai, Steffie Gosselin, Celine Schultz, Carol Schultz, Sally Schultz, cousins, numerous nieces and nephews, and friends. John lived his entire life on his farm. Farming was his passion, as was looking after the animals on the farm. He was also a school bus driver for many years for the Agassiz School Division. Johnny enjoyed going hunting and fishing with his buddies, and always had great stories to tell. His winter passion was working at the Tyndall curling rink, and he made sure the ice was just perfect. John helped to build the Tyndall curling rink, and took care of all the maintenance until he passed the baton to his friend Ron Swirski. He was a member of the Fraternal Order of the Eagles in Tyndall, the Canadian Order of the Foresters, and the Canadian Wildlife Federation. John loved sports, as he played hardball in his early years for Tyndall, and enjoyed curling. Most of all, he was well known for his kindness and generosity, as he would “give the shirt off his back” to help anyone in need. John will be greatly missed. Thank you to all the staff at Eastgate Lodge and the Beausejour Hospital for their care and compassion. A Celebration of Life will be held at 11:00 a.m., Friday, February 15, 2019 at Sobering Funeral Chapel, at 1035 Park Ave. E., Beausejour, Manitoba. A light lunch will be held at the Tyndall Curling Rink, 8 Second St., Tyndall, Manitoba immediately after the service. Honorary pallbearers will be Rick Stefansson Sr., Richard Rattai, Tom Turner, Barb Scharer, Randy Bodner and Jim Regula. In lieu of flowers, donations can be sent to the Tyndall Curling Club. To Rose and Sharon…and to all the rest of John’s family….I am deeply saddened to hear of John’s passing! John was a generous and kind soft-spoken man! His hard work and dedication to the Tyndall Curling Club was appreciated by many! I am honored to have known John for many, many years! R.I.P. Johnny…. My sincere condolences to Rose and Sharon, upon the loss of their husband and father. He will be missed and will not be forgotten for the many years he provided ice at the Tyndall Curling Club and he was always a very dedicated and gentle man. May he Rest In Peace. A full life well lived. A caring, hard working, good man. Many fond memories of the farm and curling rink. Family and community were very important, a lesson for all. Sending positive energy and healing thoughts to Aunty Rose, Sharon, Jackie, family and friends at this sad time. Rest in peace, you will be remembered fondly. My condolences to Sharon and Jackie. John’s gentle, kind spirit helped shape you to be the kind souls you have become. He taught you many skills and was able to guide you both to be strong capable women. His kind presence will be missed but he will live on within you two. Love and hugs to you both. Sending so much love and hugs to you Sharon and Jackie, may he rest easy, and fly high. Marlene and i sen d our deepest condolences to Rose and family. There isnt enough space on this page to tell of the many good times we had with you both. It seemed that back in our past whatever we did whether curling,taking care of the rink ,partying or whatever we did it together. Although we have been away for many years we always tried to see you when we got back to tyndall .We always talked about the good old days and all the fun we had.john was a wonderful friend who will be missed by everyone who had the privelage of knowing fim. Heaped prayers to hold the family up at this time of mourning as losing someone as special as your Dad or husband is one of the most difficult challenges to bear. A life well lived seems a great description of this man who quietly followed his heart and raised a beautiful strong daughter, ran a productive farm and made many friends. Dearest Uncle Johnny, It is with such sadness I hear this news, and my mind goes to all the fond memories I have of you! I didn’t even know all of the things you were involved in, but am not at all surprised. You were a treasure to family, friends and even strangers in this worldly life, and will be deeply missed. Thank you all for your kind words and condolences. My Dad was the best man I ever knew and I am honored he chose me to be his daughter. Words cannot express our grief. He was our rock and our lives are changed forever. Dad said he was ready to go and at the very end he had a tiny smile on his face. It seems whomever came to greet him he was happy to follow them to the pearly gates. I imagine a mini Gmitroski family reunion of sorts is going on in Heaven. He now rests with the angels and those who have gone before him. Thank you to all so very much. I am so grateful to read all the kind words and memories of Uncle Johnny, a gentle and kind soul to all. I can’t imagine his face without a smile beaming back at me. Bill and I enjoyed a wonderful visit with Uncle Johnny and Aunt Rose one summer. We were home and stopped in to visit, what a great decision that was! We sat at the kitchen table, drinking lemonade and listened to Uncle Johnny telling stories of days long past. He shared stories of my Dad and his siblings and we were enthralled with what life was like for all of them, the details of their life. They loved playing crib and did many things together good times and working times. He talked of the endless energy they had as they would do their chores and then go work building the curling rink or go off to play ball. He talked of the Christmases they gathered at my Bopchaw and Jawjoe’s for Christmas eve, the singing and music and also the good food they all enjoyed. I remember wishing I could have been a fly on the wall to see them all together like that. Uncle Johnny also talked about how they were hired by the railroad to clear brush away from the tracks during the winter. He said it was hard work and they didn’t have the luxury of insulated boots back then. All his memories were spoken with pride, lots of chuckles and with the satisfaction of a life well-lived. I loved the time he took to share his memories with us and I hope you enjoy hearing mine!